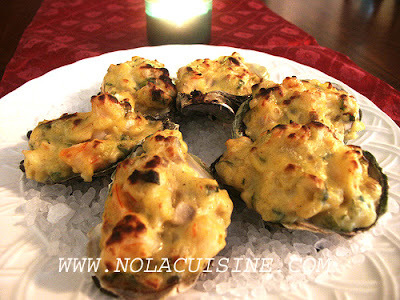 As much as I love a well made Oysters Rockefeller, this dish, Oysters Bienville, is my favorite of the baked New Orleans Oysters. I especially love this one as an appetizer for a Christmas meal, it’s richness of flavor is perfect for the holidays. Shuck the oysters, drain off the liquor into a small container; reserve. Leave the oysters on the half shell, refrigerated. Melt the butter in a large skillet over medium heat. Add the onions and garlic, saute until the onions turn slightly golden. Add the flour, stirring well to incorporate. Cook for a few minutes until it gets just a bit of color. Stir in the shrimp, mushrooms, and a bit more salt and pepper. Cook for 2-3 minutes, stirring constantly, until the shrimp start to turn pink. Add the white wine and the cream, cook for 2 minutes. Add the lemon juice, parsley, and hot sauce. Season to taste with the salt, pepper, and cayenne; remove from the heat. When the sauce is slightly cooled, stir in the egg yolks, moving quickly to incorporate and keep them from curdling. Mix the Rock Salt with remaining garnish ingredients. Heat in the oven in a seperate pie tin at the same time as the oysters. Top each Oyster with about 2 Tbsp of the prepared sauce. Place them in a pan that has a thin layer of rock salt in the bottom, this is to keep the oysters steady. Bake for 10-12 Minutes then turn on the broiler to slightly brown the tops, for 1-2 minutes. The Oysters are finished when the sauce is heated through and the edges of the oysters start to curl. Place the aromatic rock salt mixture on a large plate or platter. Arrange the Oysters Bienville decoratively around the plate. Serve. Gawd!! that looks gooooood !!!! and I know it is!!!! Well done, Danno. I saw the picture on Flickr before I came here and saw the post. It sounds and looks amazing! is this site new? or have i been hibernating for too long? i’m not even an oyster person but those pictures sure make me want to try them!!! B’Gina – Sorry you don’t like Oysters, but this stuffing would also go well in some mushroom caps as well, or some kind of delicate flavored fish. Mona – This blog has been up since this summer, same content as my blogger site, but I hope better. oh my god. someone who actually knows how to make bienville. they have been my favorite since i lived next to bayou st john as a child. no one remembers how they are supposed to be served. the last time i ordered them in new orleans, they were served with cheddar cheese on top. thank you for keeping the real recipes alive. who are you???? before katrina, if i had cooking questiona, i’d call down to venice(mr brad, mr emmett, miss shirley and miss muriel. miss muriel’s son drives her once a year past slidell into mississippi to pick sassafras leaves. her file is vibrant green, not brown. makes you understand the fuss about the sassafras v. okra debate when making gumbo. te. I made this in class tonight. The production plan that Chef makes up only lists ingredients, so I had no idea what it was. I did a search before hand to get some ideas and this post popped up. Tres bien. Thanks for the info. Beautiful recipe! How would you adapt this if you wanted to wrap it up in puff pastry or something sinful?